Sammy Keyes, girl sleuth extraordinaire, cracks the case once again in the latest installment of Wendelin Van Draanen's smart, snappy mystery series. This time, the trouble begins when 13-year-old Sammy ("a magnet for mayhem") attends a fancy reception at an art gallery (wearing high-tops, of course) and ends up tackling a gun-wielding art burglar who crashes the party. He, however, proves to be only one of an entire gallery of rogues. As ever, Van Draanen crafts an entertaining, multi-layered page-turner starring a brash, likable heroine with a big mouth and a big heart. Throw in a little romance at a Renaissance Faire, a whole new side to Sammy's grandmother (what's this about a tricked-out Harley? ), and some thoughtful views on the nature of art, and voila! 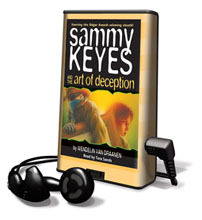 You have one of the best Sammy Keyes books to date.